Question: I have a hard time fueling adequately in cross country races since they are so intense. It is hard to get enough water and calorie intake. How can I work on this? Is it ok to go into deficit a bit in a 2-hour race? Answer: This is a great question and having an event-specific nutrition and hydration strategy is important. The high intensity of cross country racing will factor into your race day nutrition and hydration planning. Arriving to the start line with glycogen stores topped off and properly hydrated is the first priority. Doing things right during the race won’t correct poor nutrition or hydration prior to the start, so be sure to keep the big picture in mind too. Caloric deficit during a cross country race is 100% expected. It would be ill-advised to attempt replacing all of the energy that you are expending during the race. The gut simply cannot process carbohydrates at the same rate that you’re able to expend them during intense exercise. A 2.5 hour XC race will often require you to empty the tank, whereas the faster paced, but shorter 1.5 hour XCO races typically do not. A two-hour cross country won’t quite fully deplete your body’s glycogen stores, but there won’t be a whole lot left in the tank at the finish line either. A well execute nutrition strategy will allow you to finish strong despite seriously depleted energy reserves. Asker Jeukendrup is a leader in endurance sports nutrition and he’s got some excellent science-based resources on his website, mysportscience.com. For events lasting 1-2 hours, 30 grams of carbohydrate per hour will help to improve performance. Even though your body has adequate stores for this duration taking in additional carbohydrates will offer you greater performance. If you’re looking at 2-3 hours of racing you might want to consider 60g/hour. The body can only absorb so many carbohydrates per hour and ingesting more does not mean that you’ll find greater benefit. Further intake comes with the risk of upsetting your GI system, so you’ll want to know what you can get away with. It is possible to increase the absorptive capacity of the gut. You can train yourself to process an increased rate of carbohydrate intake which is especially useful for longer races where you might want to take on 60 or more grams per hour. Practice your race nutrition in training so that you know how your body responds to various food options and at various intensities. What works great on endurance rides might not be the best option when the intensity is high. For cross country events most racers will prefer simple fuel sources such as energy gels or Clif Bloks. These options are easy to get down and your body can convert them to useable energy rapidly. As for hydration concerns, the environmental conditions will play a considerable role in what’s best for race day. Drinking to thirst works for some, but it’s best to have a hydration plan that you’re confident in. Losing a few pounds due to fluid loss is acceptable, but too much fluid loss can lead to reduced performance. In hot conditions, keeping hydrated will help you keep cool too, so fluids are especially important in those situations. Most riders will benefit from including some carbohydrates in their drink to speed up the rate at which it’s absorbed, effectively hydrating you faster than water alone. A carbohydrate solution of 4-5% works best for most riders. Intensity, humidity, air temperature, and elevation are all factors that affect your fluid requirements. Plan to have enough fluids available given the scenario you’re likely face. While cross country races might not deplete the body like marathon distances do, ingesting carbohydrates and keeping hydrated are still very important in these high intensity races. Knowing what your stomach tolerates and what keeps you appropriately hydrated will allow you to have the best results possible. Having practiced your nutrition and hydration in training, you’ll have fewer “what ifs” floating through your head on race morning. The precise requirements of each race will be slightly different, but experience will help you along the way. If you don’t know where to start or can’t seem to sort out the best solution, be sure to talk with your coach or work with a sports nutrition expert on these topics. When you’re fueled properly you’ll have the most fun. 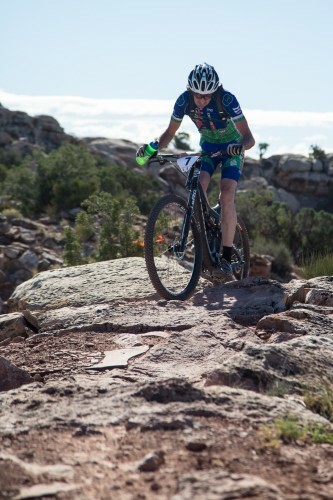 This entry was posted in Coaching Column and tagged cycling fitness, mountain bike training, travis woodruff by Shannon Boffeli. Bookmark the permalink.